Looking for a holiday gift basket that is a cut above all of the rest? Well look no further, this unique basket is filled with delicious smoked sausages, assorted specialty cheeses and gourmet crackers. This extra large basket is overflowing with savory snacks. It is stuffed with holiday favorites such as 5 ounce each of hickory smoked beef summer sausage, thuringer summer sausage, and beef salami, honey mustard pretzels, chocolate hazelnut biscotti, butter toasted crackers, garlic and herb crackers, original recipe wine-cheese-caviar crackers, pepper and poppy wine-cheese-caviar crackers, tomato and basil cheese, Wisconsin cheddar cheese, brie and vegetable cheese spreads, and cabernet sauvignon flavored cheddar cheese spread, a festive holiday cheese spreader, more crackers, pistachios, hickory smoked almonds, Wisconsin cranberry cheddar cheese, deluxe cashews nut mix, "Boca bar" cocktail mix, a delicious mixture of dried fruit and nuts, wild Alaskan smoked salmon, gourmet snack mix with cranberries and almonds, for Maggio's cheddar pesto rounds, old fashioned scotch oatmeal cookies and deliciously creamy chocolate fudge. 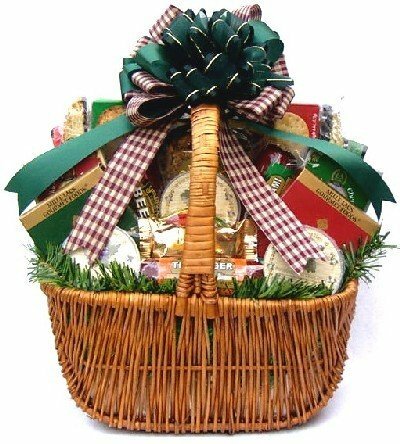 This bountiful gourmet arrangement arrives adorned with frosted pine designer ribbon and is set in a beautiful and unique wicker basket. What a great holiday gift basket to send to an office or large group. This is one of our largest holiday cheese and sausage baskets ever and even has enough to send to a large family.